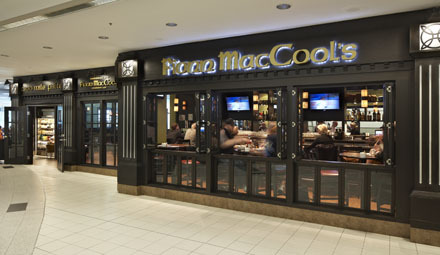 Cool MacCool’s | On The Road with Ms. M.
After going through security coming back from NYC, I was delighted to find that my gate was right in front of me rather than the last one in a long list heading down the hallway. Also, right there was an Irish Pub called Fionn MacCool’s. I had seen one in Ottawa when heading out but breakfast time is not usually a time that draws me towards a pub. However, at 2 in the pm with a 2 hr wait until boarding and having got up before 6 am, I decided this was the activity of choice and I ventured in to have a spot of late lunch/early dinner. (On short flights you’re lucky to get a cup of cold water and some cookies.) MacCool’s was delightful. Hostess was prompt and courteous, waiter was friendly, atmosphere was great (you could almost forget you were in an airport), and the food was GREAT!! I had steak and chips for a reasonable price and, despite my diet, I ate almost everything on my plate, chips included. The steak was done to perfection, the fries were delicious, and there were 2 slices of thick tomato that had been broiled, then had spices added on top and baked for about 1-2 min. (information obtained from friendly waiter). Those tomatoes were the icing on the cake, so to speak! They were great. I can’t wait to try it out at home. So the next time you have a couple of hours to kill at an airport, check out MacCool’s terrific menu. Stay calm, forget the pressures, and be ready to board your plane in a very relaxed mood.